Travel is fun but doing laundry while traveling can be a tedious chore. However, washing your clothes during a trip gives you the advantage of being able to pack less, rewear your favorite travel clothing, and return home with less dirty laundry. If you are going on a trip of more than a week, you’ll probably be thinking of laundry options. It can be difficult to figure out the best way to wash your clothes on a trip, and you don’t want to waste much of your vacation time on laundry. We’ve done trips of 6 months or more at a time, so doing laundry while traveling was essential! 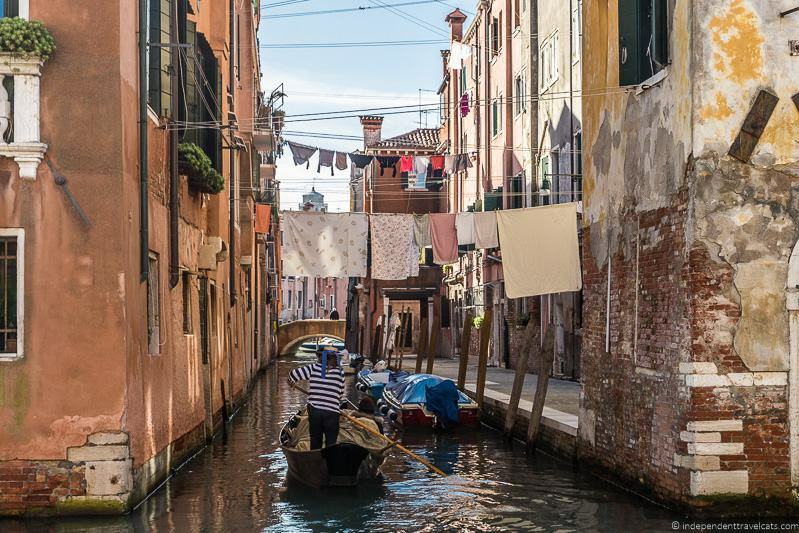 We’ve put together a guide to washing clothing while traveling for all budgets, whether you are a backpacker or luxury traveler. We cover all your options from hotel services to laundromats to hand washing in the hotel sink to camping solutions. We also list several products that we have found helpful in doing laundry while on the road that you may want to include in your own travel laundry kit. We also provide laundry product suggestions and tips for those those traveling in an RV, campervan, or motorhome. 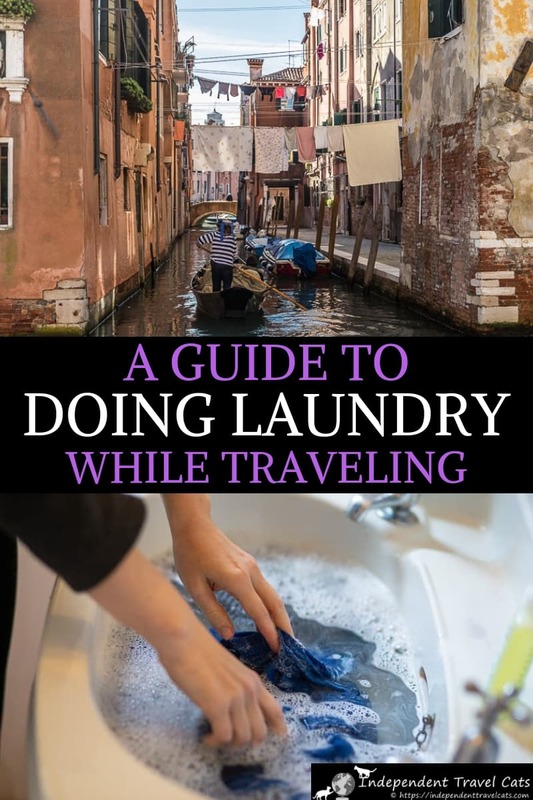 There are a number of options of how to wash your laundry while traveling, and it depends a lot on your budget, where you are going, and your travel style. Most full-service hotels (and cruise ships) offer laundry services, which generally include washing, drying, ironing, and hanging or folding your clothes. Many also offer dry cleaning services. There is normally a laundry bag in your room that you can use to place your dirty laundry inside and you then fill out a form to let the hotel know what you need done. The forms normally includes the rates charged for each service. Directions of where to leave your laundry are normally on the laundry bag (e.g., leave it in your room for housekeeping, call front desk). Normally you need to allow 24 hours to get your clothes returned to you clean although some hotels offer express same-day service. Sometimes the hotel has its own in-house laundry services it will use, and other hotels send out your laundry to an outside service. This is normally the most expensive way to have your clothes laundered while traveling. Hotel laundry costs in the United States and Western Europe are often around $3 to $5 per shirt, $6 per dress, and $2 to $3 for underwear. Adding these up, you are looking at $30 to $50 for a load of laundry (we’ve seen prices as high as $70!) whereas you can do a full load of laundry at a laundromat for about $6. The trade-off of course is the convenience as hotel laundry services are easy and convenient. However, they are also your most expensive option. If you are on a budget, we’d recommend another option. However, in some countries, such as many in Asia, Africa, and Latin America, prices for laundry are very inexpensive. So you may pay only a few dollars for a load of laundry to be washed and dried and this is both a convenient and inexpensive option. However, luxury hotels in these countries often still have fairly high prices. Note that in some places, this may be your only option. For instance in a national park in Africa, we had not other options for laundry services outside of our lodging. However, prices are generally much more reasonable in developing countries. Another way is to hand wash your dirty clothing in the hotel sink or bath tub. This simply means filling up the sink with water, adding laundry soap, and hand washing your dirty clothing items. Then you can hang them up over the bath tub or shower to dry. If you are new to hand washing, you can skip ahead to read our detailed step-by-step guide to hand washing your clothing. This is great way to do smaller items like socks, underwear, hosiery, tank tops, tee shirts, etc. However, it may be less effective for larger items and more soiled clothing. It also works best with items made of quick dry fabrics that are able to hang and dry overnight (or at least within 24 hours). Items hung in humid environments, such as tropical countries, are going to take longer to dry. If you plan to do a lot of hand washing, we recommend packing clothing made of quick dry fabrics. Synthetic fabrics typically dry faster than natural fibers, and quick dry fabrics include polyester, nylon, and other synthetic fabrics. Synthetic blends combine natural fibers with synthetic ones. Columbia, Ex-Officio, prAna, and Adidas are a few well-known brands that produce a lot of quick dry clothing that is well-suited for travel and sports. You can see more examples of quick dry clothing items here. You’ll need to bring your own laundry soap and any other products you need. We’d also recommend bringing a sink stopper and a travel clothesline. Some motels around the world have a retractable clothesline installed over the bathtub so guests can do hand laundry but the majority do not. 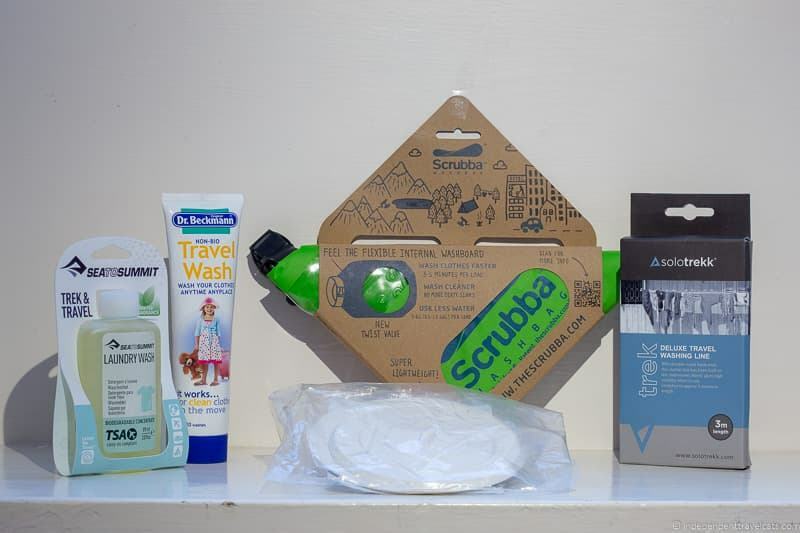 For those who plan to do a lot of hand washing or are traveling for a longer period of time, we also recommend considering a Scrubba travel washing bag or a mini washboard to get items cleaner. Note that some hotels strongly discourage guests doing laundry in sinks and hanging it in the rooms, and it may be against the hotel policy. The main reason is that some guests make a wet mess all over the bathroom and cause extra work for the housekeeping staff and possible damage. Other reasons may be related to saving water, the extra humidity that may damage walls, hygiene, and getting lint stuck in drains. Hotels with their own laundry services may also want to encourage you use them instead. Hand washing laundry is a great way to save money and is common among budget travelers; however, be sure to be a good guest and do it without making a mess or wasting water. Don’t hang wet laundry anywhere where the dripping water may cause damage. Another option is to book lodging with some sort of self-service laundry option whether it is an apartment, campsite, or hostel. The laundry facilities may be free or require a small fee. You can book apartments, rooms, vacation homes, or other types of accommodation that come with a washing machine (and possibly a dryer) in the apartment or home. These are typically free to use in apartments and Airbnb properties if they are private, or are coin-operated if shared within the building. Laundry detergent, dryer sheets, and other products may be left to help you do laundry or you may need to bring these with you, so it’s good to check ahead. Airbnb properties can be a good option if you are seeking an apartment or room with laundry facilities while traveling. If you haven’t used Airbnb before, you can read our Airbnb review here and can sign up and get up to $30 off your first booking here. You can also check out our other suggested apartment booking sites like AirBnB. Self-service laundry facilities are also often available in hostels, apartment complexes, cruise ships, nicer RV and campsites, resorts, and some motels. These may be free to use, but they usually require a fee (often around $2.00 per load). Typically they work with coins or cash. You will also normally need to bring your own laundry detergent and other products or buy them on-site. Laundromats, also commonly known as coin laundries, launderettes, and laundrettes, are facilities where people can wash their laundry on their own or with little professional help. These may just offer self-service washing and drying machines (typically coin-operated), or they may offer additional services such as drop off laundry services where someone else washes, dries, and folds you laundry. They may also offer other services such as dry cleaning or tailoring. Some have an on-site staff member to provide help and to provide change, but some are now totally self-service. Laundromats are common in some countries but nonexistent in others, so you will want to do your research in advance to see if there will be laundromats along your travels. Also, most laundromats exist in cities and larger towns, but you’re unlikely to find them in small towns or rural areas even in countries like the United States where laundromats are relatively common. Machines typically work with coins or tokens, so it is a good idea to bring cash. If you have cash but no coins, many coin-operated laundromats have coin machines on-site you can use to get coins or an assistant who can exchange cash for coins. A few newer laundromats have machines you can pay for using a phone app. It is typically about USD $1.00 to $3.00 per wash and $1.00 to $3.00 per dry if you use the coin-operated machines, and machines will typically hold a large load. You can use multiple machines at once so you can do all your washing at once and then all your drying at once if you have multiple loads. Most laundromats have heavy-duty professional machines which can hold larger loads and wash or dry laundry faster than a typical home machine. Another option offered by many laundromats is a drop off option where you drop off your laundry and a staff member will wash, dry, and fold your laundry for you. You just need to pick it back up. Although more convenient, this service is normally 3 to 4 times more expensive than doing your laundry yourself. There is always seating available in laundromats, but there may or may not be any other amenities. WiFi is fairly common these days. You are wise to bring along a book/magazine, headphones, tablet/laptop, cards, etc. to keep yourself occupied while you wait. We played a few games of UNO (a card game) the last time we were in a laundromat while traveling with my brother. Some newer laundromats offer wide screen TVs, work desks, arcade games, coffee, etc. but these are not typical. The main advantage is that laundromats are inexpensive and they allow you to do all your laundry at once. It can also be a place to meet other travelers and locals while waiting. However, the main disadvantage is that it takes time out of your vacation to do the laundry. We recommend planning your trip around your schedule so doing it after you are done sightseeing for the day or when you need a break from the sun in the middle of the afternoon. Or you can consider the drop off/pick up option if you don’t have time to wait at a laundromat. If you plan to use laundromats, it is a good idea to check on their locations before your trip so you know they are available and you can get an idea of what hours they are open. If you don’t want to pay for hotel laundry services and are in an area without laundromats, you might want to see out local laundry services. These are services where you drop off your laundry and someone does it for you and you either pick it back up or it delivered to you. In some countries, they may be attached to dry cleaners or tailors, or they may simply be a local family or just a single woman who does laundry from their home or shop. These can be difficult to find, especially if you don’t speak the local language, so you may need to ask around at your lodging and local people. Costs will vary greatly by country for such services, but can be very inexpensive in certain parts of the world. In our experience, when we’ve needed laundry in places where there are no laundromats or specific laundry services, our hotel or guest house has either suggested someone or offered to do the laundry for us for a small charge. Generally local people know someone locally who is willing to do laundry for a small fee. This has happened to us in both Africa and Asia. If you are traveling by RV or campervan, you have most of the above options such as stopping at laundromats or hand washing items. One advantage for those who want to hand wash is that RV travelers have more space for laundry supplies than regular travelers, and often have the ability to wash and hang laundry outdoors. Many RV sites and campgrounds have coin-operated laundry facilities you can use along the way. There are also all kinds of mini movable compact washing units that are designed for compact spaces like RVs and small apartments. Some are run by electricity and others work without electricity. For those traveling more long-term, some larger RVs, particularly in the United States, even have washing machines and dryers installed in them that tend to be smaller versions of regular home machines. If you are going on a camping, long-distance hiking, backpacking, or other type of outdoors holiday, you can do your laundry using natural water resources outdoors. People have been hand washing clothing using water directly from rivers, streams, and lakes for centuries. Since your waste water will be going directly into the environment, be sure to use biodegradable environmental-friendly laundry soaps such as those offered by Campsuds or Sea to Summit. Many of these laundry soaps are multipurpose and designed to be used for all kinds of cleaning purposes including as a shampoo, dish soap, hand soap, and shaving soap. One strategy to wash clothes in the outdoors is to use a Scrubba washing bag to help get clothes cleaner. Find relatively clean water, fill up the bag, add clothes and soaps, scrub, and rinse. Or a cheaper option is to use a regular dry bag in a similar fashion. Of course, if you are staying at campsites during your trip, campsites normally have laundry facilities or at least a sink where you can hand wash laundry. If you are planning on doing your own laundry on the go, we recommend putting together a lightweight travel bag of all your laundry items. All the things you need can be put together in your dirty laundry bag, Scrubba washing bag, or in a Ziploc bag so you have them when you need them. 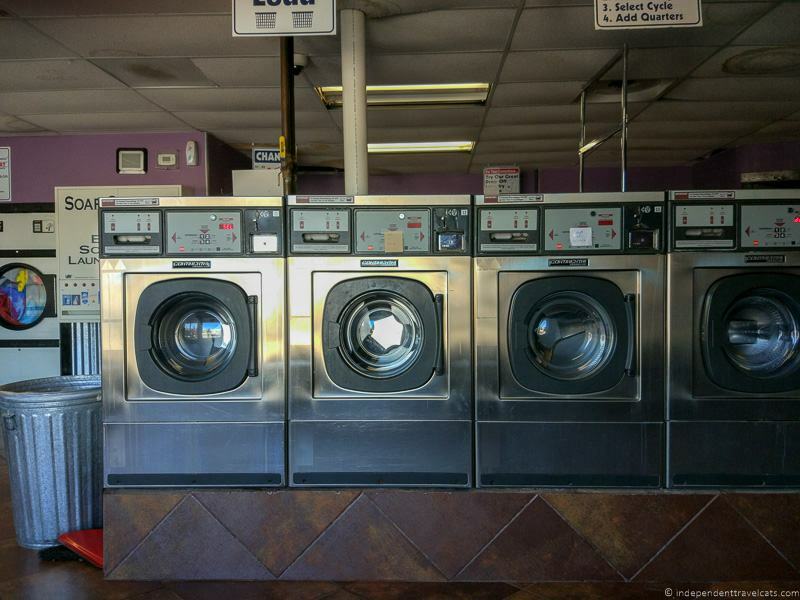 If you plan to use laundromats, you probably just need to bring a pack of detergent and maybe some dryer sheets. But if you plan to hand wash items, you may want to bring along a few more of the laundry items below. A sink stopper or bath stopper will help you plug the drain in the hotel sink or bath tub so you can hand wash your clothes. Although many hotels and apartments of course have a stopper, you might be surprised to know how many do NOT have one. Do it Best Rubber Stopper – This simple 5 inch rubber stopper lies flat and fits most sink and bath tub drains. This is the one we have and it has worked with the vast majority of drains we’ve tried it on. Mudder Silicone Stopper – This well-reviewed 6 inch sink stopper lies flat and is made of food grade silicone. Most options lie flat (such as the suggested options above) and take up very little space. If you have one like we do that just lies flat but doesn’t work with suction, you need to hold it flat until the sink or tub has a bit of water in it first and the stopper is completely submerged. The weight of the water keeps it down. There is no sink stopper that will work on all sinks or tubs, but we recommend getting a good universal one that will cover most drains effectively. We like the ones that lie flat over the drain. If you are bath lover, this is also a great item to take with you if you enjoy taking baths when you travel. As a bath lover myself, I always have a flat bath stopper at the bottom of my luggage after numerous experiences finding myself with a bath tub but no stopper or convenient way to plug the drain! A travel clothesline lets you hang up your clothes to dry while you are traveling. You can use it in your hotel bathroom, rented apartment, campsite, or RV/campervan. Going in Style line – This travel laundry clothesline is made of surgical quality braided rubber tubing and comes with loops as well as ties and a Velcro closure. Stretches up to 7 feet (2.1 meters). HAWATour portable clothesline – This travel clothesline is made of plastic and stainless steel and includes attached clothespins. It attaches using hooks. It stretches to about 10 feet (3 meters). solotrekk Deluxe Washing Line – This travel clothesline is made of interwoven elastic and has durable metal hooks on the ends. It stretches to about 10 feet (3 meters). Coghlan’s Bungee Clothesline – This travel clotheslines is well-reviewed and made of twisted nylon covered elastic with carabiner like hooks on each end. Stretches to 10 feet (3 meters). We recommend avoiding the travel clotheslines that attach only with suction cups. Although suction cups can work well on some smooth surfaces, they will be more limited than ones that come with hooks, carabiners, or stretchy loops at the ends. So we suggest getting one that has loops or hooks or has both suction cups as well as loops/hooks. The trickiest part of these clotheslines is getting savvy at how to use them. The first step is to find a place to attach the two ends. This may require hooking it, looping it, or wrapping it around something and attaching it to itself. Depending on where you are this could be a towel rack, shower rod, door handle, tree, RV ladder, etc. I’d test using the travel laundry line at home before your trip so you understand how to do it. Depending on the line you have, packing an extra lightweight carabiner or velcro strap can help so you have more attachment options. To hang your clothes, for the braided elastic lines, you insert the fabric of the wet laundry between the braided elastic parts when the line is stretched to hang it. So for a shirt, you’d probably want to attach it at both shoulder areas. No clothespins or pegs are needed. For the lines with clothespins attached, you simply attach the clothes to the pegs. If you are going to do laundry, the one thing you definitely need to have is some sort of laundry detergent. Using hotel soap is not always a great idea as it not meant for clothing, can take a long time to rinse out, and can leave clothes feeling scratchy. One option is to get travel-sized bottles or tubes and fill them with existing laundry soap you have at home. I’d recommend this is you have a brand you really love. Or you can buy travel-sized laundry detergents. Most laundry detergents come in liquid form. We recommend liquid as it is most effective, but if you want to avoid carrying liquids, laundry detergent sheets are also available. Woolite travel packets – Individual packets of pre-measured liquid detergent. They pack well and the detergent is phosphate-free and biodegradable. Work well in any water temperature and on both types of fabric.These have been my go-to for years when doing laundry on the go, but it’s difficult to find travel sized packets outside the U.S. Tide Packets – If you use Tide at home and want to use it on the go, this is a good option. Comes in multiple individual packets. Biodegradable and contains no phosphates. Sea to Summit – A concentrated liquid formula that is biodegradable, phosphate-free, and paraben-free. Comes in a 3 fl. oz bottle and has a light green tea fragrance. Campsuds – This well-known camping brand wash liquid is meant to be used as any kind of soap, including as a shampoo, laundry soap, dishwashing soap, and shaving soap. Biodegradable and eco-friendly. Good option for those who have limited space. Dr. Beckmann Wash – A concentrated laundry gel option in a 100 ml (3.4 oz) tube. Contains no enzymes so good for those with sensitive skin or skin conditions like eczema. Can do up to 20 washes. Dry laundry soap sheets – If you are looking for a non-liquid option, you might want to check out laundry detergent sheets that dissolve in water from TravelOn or Sea to Summit. Just be careful to use completely dry hands to use these as any moisture will make all the sheets clump together. If you or a fellow traveler have sensitive skin or a skin condition like eczema, I’d test the laundry soap before you travel if it is a brand you don’t normally use. The non-bio and enzyme free formulas are best for those with skin conditions. Note that most travel detergents sold for handwashing are more gentle than the average detergent on the market and may not be great at getting out tough stains. So you may need to wait until you get home, have them laundered in a machine, or use a stain remover. If you like your clothes to be soft, you might also want to bring along a travel sized bottle of fabric softener as doing laundry by hand often leaves clothes a bit stiffer and scratchier than doing it by machine. You can add in a little fabric softener in the final rinse if hand washing. If you plan to use specific washing machines during your travels (e.g., at a vacation home), you might want to ask before your trip if there is specific type of laundry detergent that is needed or recommended (e.g., liquid versus powder, high efficiency versus standard). Remember that if you are flying, you will want to use bottles or tubes that hold 3.4 fluid ounces (100 ml) or less to satisfy TSA rules and airline regulations if they are going in your carry-on luggage. If the container will hold more than 3.4 oz. be sure to put it in your checked luggage. Hand washing clothing in the sink does an OK job of cleaning and rinsing your clothing, but it doesn’t really compare to a machine wash. If you plan to hand wash a lot, we’d recommend checking out a hand “washing machine” bag which is more effective than hand washing. 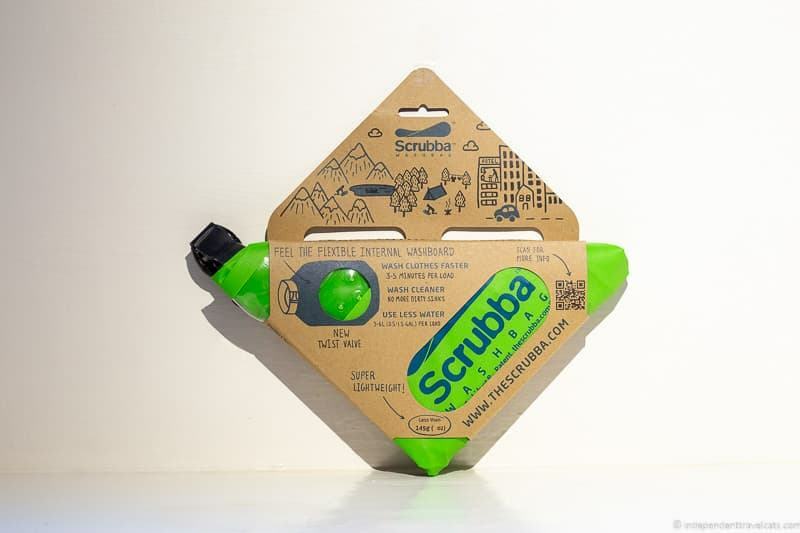 The Scrubba washing bag is billed as the world’s smallest and lightest washing machine. You can wash small loads of clothing in it in 3 minutes. The texture in the bag is similar to an old-fashioned flexible internal washboard which helps scrub your clothes and get them cleaner than just squeezing, swirling, and rinsing them in a sink. To use the Scrubba, you just follow the directions on the bag. First you fill it with the water, laundry detergent, and clothing. Then roll and clip the bag, and remove the air. Then you rub the clothing for about 3 minutes. Then release dirty water, rinse clothing with clean water within bag, and then remove clothes and hang up to dry. The Scrubba doesn’t take up too much space and you can use it to store dirty laundry or your laundry supplies when it is not being used. Just be sure not to put in anything that might tear the bag. We have found that the Scrubba is best for doing smaller items like socks, underwear, shirts, camisoles, hosiery, sportswear, shorts, baby items, etc. Several pieces of clothing can fit in it at once. You wouldn’t want to use it for large or bulky items or for items that have sharp or jagged elements which could puncture or damage the bag. 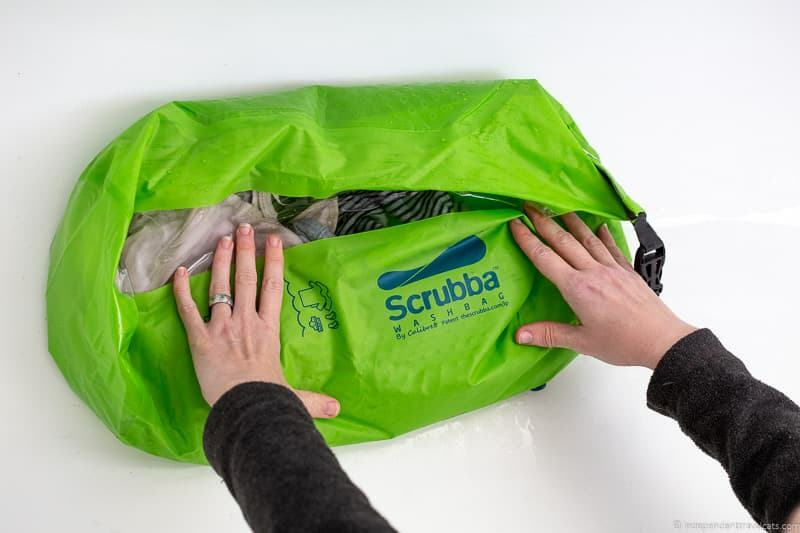 The Scrubba is basically an innovative dry bag for laundry. Dry bags have been used by campers and outdoor enthusiasts to clean laundry for years, but the design, drain, and internal washboard of the Scrubba make it more ideal for laundry. However, if you on a tight budget or need something that is more dual purpose, a dry bag can also be used. If you are planning to use dryers during your travels, you might want to pack along a few of your favorite dryer sheets. They take up almost no space and can help keep clothes soft and static-free. As a bonus, they can also help freshen up the scent of your luggage! Note: Many brands of dryer sheets and fabric softeners contain toxic and carcinogenic substances (can read more about that here). We recommend choosing a brand that uses non-toxic ingredients or choosing a eco-friendly reusuable dryer sheet. When traveling, you will also of course need a place to store your dirty laundry and keep it separate from your clean clothes. 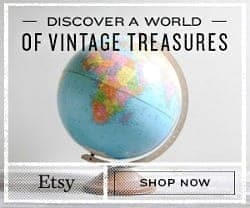 You can use a drawstring bag, a packing cube, a special pouch in your backpack, or anything else you might already own that would do the job. Wash Me Bag – This bag has a fun design and is made of a microfiber material and has a drawstring closure. The bag opens up to 21”L x 22”W size, but when not in use it folds up to about 6 inches and zips shut. You can see more fun designs of these bags here. Map Drawstring Bag – This laundry bag is made of polyester with a map design and a drawstring closure. Capable of holding up to 6.6 pounds of laundry. Folds up small. Large Mesh Bag – This simple white bag is made of a strong mesh material and has a drawstring closure. Bag can hold us to 3 washing machine loads of laundry, so a good option for those who need a larger bag! Folds up small when not in use. If you are traveling by RV or caravan, you have more space than someone traveling with just a suitcase or those traveling by car. Although many of the previous mentioned laundry items and products may be helpful, with an RV you can save money by purchasing larger containers of laundry detergent, consider more effective methods of hand washing laundry, and even consider a portable or permanent washing machine solution. RVers can take advantage of being able to dry clothes both indoors or outdoors. There are a number of collapsible drying racks designed for RVs and motorhomes, some are free standing while others attach directly to the ladder on the back of the vehicle like this one and this one. Sinks in many RVs are small and some campervans may not have one at all. It can also be difficult to clean and utilize a kitchen or bathroom sink for laundry purposes. An easy solution for hand washing is to get an inexpensive plastic basin or dishpan like this one. These all-purpose basins come in a variety of shapes and sizes and can be used for washing laundry, soaking, dishes, etc. When not in use, you can store your laundry supplies in them. If you are planning to do a lot of washing by hand, you might want to pack along an old-fashioned washboard. These can help you get clothes cleaner and help scrub out stains. The less expensive washboards are made of plastic but there are also ones made of wood. Many come in compact sizes so that they are easy to stow away and store. You can see some washboard options here. If you don’t have room for a full washboard, there are also these mini handheld scrubbers that fit into the palm of your hand. If you want something more convenient and have a bit more space in your RV, you might consider a portable and compact washing unit. Some of these are essentially mini spin washing machines that work with electricity and some are electricity-free washing machines that are powered by a hand crank. Larger RVs and motorhomes may have space for compact or full-size washing and dryer machines. A number of washing and dryer units have been designed to work aboard RVs, such as this Splendide washer/dryer unit. You can see a list of models here. Of course the downsides of installing a washer or dryer is they are expensive, take up a lot of space, and will require maintenance. We wanted to make a note about the use of ultrasonic cleaning technology as there have been a recent flood of ultrasonic cleaning products marketed towards cleaning clothes while traveling. The technology of using ultrasound for cleaning is a sound technology and has been used for decades. Ultrasound is combined with a cleaning solvent or just water to provide cleaning. The technology has been used to effectively clean and sterilize a number of different types of hard-to-clean objects including watches, jewelry, lenses, medical instruments, fountain pens, sports equipment, CDs, eyewear, etc. So it is not surprising that there has been numerous attempts to try to apply this to washing clothing and laundry solutions. Lately, there have been a number of portable units developed and marketed for travel and quick laundry solutions. These portable ultrasonic washing machines are usually in the form of a wand or disc attached to small handheld unit that you place in a sink or container of water and leave for a certain amount of time to clean. You can see a good selection of these units here. There are four main problems so far with these units. First, the technology work best on hard surfaces so the porous and flexible surfaces of clothing is not ideal. Second, the more clothing you try to clean, the more the cleaning ability is dulled. Third, many are too small or don’t have enough power to really work effectively. Lastly, they are rarely dual voltage meaning they only work for 120V or 230V normally so are not ideal for international travel. Overall, we personally can’t recommend these products. Our experience and the reviews of others so far do not support these as effective laundry solutions for those wanting to wash clothing while traveling. 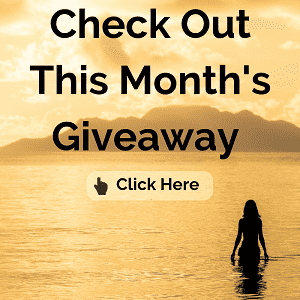 We have had multiple companies contact us about trying to get their product included in our article and we can’t recommend any of them so far. If you do decide to try one, be sure to read recent reviews and the return policy information carefully before making your purchase. Also be sure the product you are buying will work in the places you want to use it (e.g., a 120V product is not going to work well in Spain without needing a converter). However, this is a space to watch as being able to have a portable and effective laundry wand that just needs to be added to water would be an ideal travel laundry solution for many people. If you have used such a product that you believe is effective, do let us know about it. We’d love to find an effective product in this category! When discussing the topic of laundry with others, we found that some people had never hand washed their clothes before. If you have never hand washed clothing before, or are wondering if you are doing it properly, here is a step-by-step guide. This will work whether you are hand washing some delicates at home or washing your clothing by hand on a trip. Grab your dirty laundry and sort clothes by color (like you would with machine washing) and wash dark and light colors separately. Check your clothing labels. Lay aside very delicate items to do on their own. Always wash out the sink or bath before using it for laundry. Dirt or residues can be in the sink, such as from bleach cleaners, that can stain or discolor clothing. Fill the sink with lukewarm water (don’t use hot water). Add your laundry soap to the running water. Read directions on how much you need to use. For most, you just need to add a few drops of a regular liquid detergent or a capful of travel-sized hand wash laundry soap. Now place you dirty clothing in the sink. Don’t put all your clothing into the sink at once, wash only a couple of items at a time for best results. 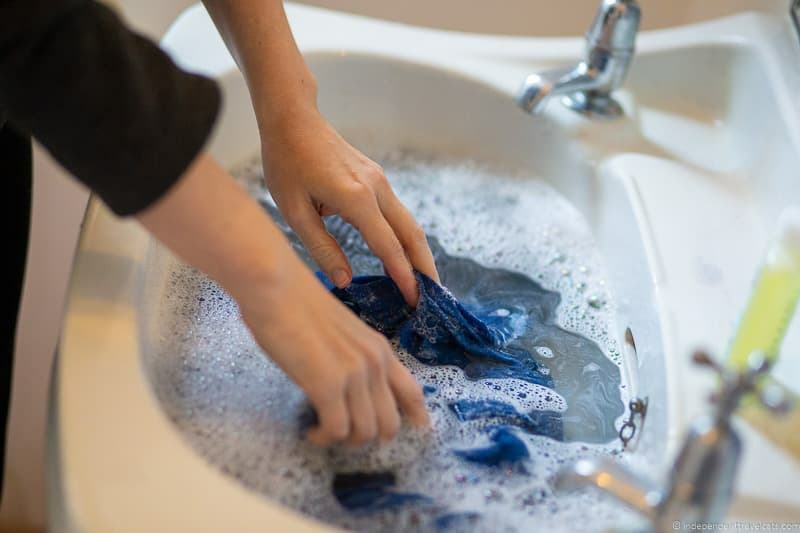 Try to use a bath tub or basin if you have a lot of clothing to wash.
Swirl, swish, and knead the clothing in the soapy water for about 2 minutes to get them clean. If there are any more soiled areas or stains, you’ll want to spend extra time on the stained area and do some light scrubbing with your hand to try to get the soil off. If the items are soiled you may want to use a laundry scrubbing brush or washboard. For longer term travels, you may consider getting a portable small washboard or one of these mini handheld scrubbers. If you are using fabric softener you may want to drain the water after the wash, and fill up the sink again and add a couple of drops of the fabric softener to the water. Note: If you have more than one sink full of clothing, we would recommend doing all your washing first, and then rinse out the sink and rinse all the clothing. This will make things faster and help conserve water. Next rinse the clothing in clean water. If you only have one sink or basin, you’ll need to drain and rinse the sink first and then place the clothing back in to rinse. Be sure to rinse out the soap suds in the sink basic before filling it up again with clean water. Place clothing back in and swish around until there are no more soap suds coming from them. This may take a couple of rinses, so you may need to fill up the sink a couple of times. Repeat until water runs clear from clothing. After all the soap is rinsed out, gently squeeze the water out of the clothing. Be careful not to wring delicate items or items made of certain fabrics (like wool) as it can damage the fibers and cause them to lose their shape. For delicate fabrics or heavier items, you may want to place them in a thick towel and then roll up to absorb the water before hanging or laying flat to dry. Hang your clothing up to dry on a travel clothing line, shower bar, or clothing dryer rack. Try to hang in a ventilated space for best results, and make sure that any dripping water will not damage surfaces. Read care instructions. Some items like a wool sweater should be laid flat to dry to keep it from loosing its shape. Below are some tips, advice, and reminders about washing clothes when traveling to help you get your clothes clean while minimizing the headaches and time spent doing laundry. Consider where and how you are traveling to determine the best way to do laundry during your trip. What will work at one destination may not work well in another. 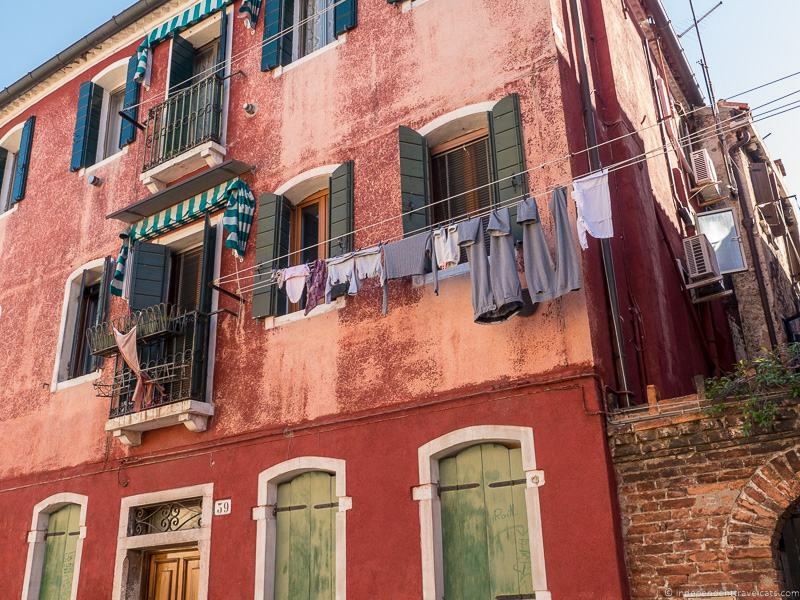 Spend a few minutes thinking and researching how you will do laundry while traveling. Doing it before your trip will keep you from wasting valuable vacation time figuring out how and where to do laundry. For example: Plan may be to stop at laundromats in City X and City X, and you’ve checked that laundromats exist in these cities. Or your plan may be to book an apartment every 6 days that has a washing machine and dryer. Or to pack laundry soap and supplies to hand wash your smaller items every few days. Always read the care labels of your clothing before you pack or wash them. Most garments, even silk, wool, and linen, can be handwashed, but they need to be hand washed with a gentle laundry soap. Best to leave delicate, expensive, and “dry clean only” items at home. If you or a member of your family has sensitive skin or a skin condition like eczema, be sure to pack a gentle laundry soap that you’ve tested at home. You don’t want an allergic reaction or rash to deal with while traveling. If you are planning to air dry your clothing, be sure that you time your washing so there is enough time for your clothes to dry completely before you need to move again. Traveling with damp clothing is not fun, and clothing tends to become smelly and wrinkly when not dried properly. Remember that clothes will dry more slowly in humid climates than in dry climates. If you are planning to hand wash your clothing or letting it air dry, pack quick drying clothing when you can. Clothes that dry overnight or within 24 hours will give you much more flexibility in timing and doing laundry. Remember that synthetic fabrics typically dry faster than natural fibers, and quick dry fabrics include polyester, nylon, and other synthetic fabrics. If your plan is to use laundromats, do a little research before your trip to make sure laundromats are available in the places you are traveling. Some countries don’t have them and they can be difficult to find in certain areas even in countries where they are fairly common. If you plan to rent places with private laundry facilities (e.g., an apartment, room, or vacation home with washing machine) in a country where this is not that common, it is wise to book such properties in advance. Remember that although most homes in your home country may have washing machines, most families in the world do not have access to a washing machine and have to wash their clothing by hand. For Americans traveling to Europe (or elsewhere), while washing machines are common throughout households in the UK and most of Europe, tumble dryers are not. Washing machines and dryers are also usually smaller. Also be warned that the washer/dryer combo units crammed into small apartments often don’t work as well (especially the dryer) as full-sized separate machines. If you have booked places to stay which have private or shared laundry facilities, you can ask in advance of your trip what you should bring. For instance laundry soap may or may not be provided or available. Remember that washing machines and dryers can make a lot of noise. So be sure to be respectful of your neighbors and do your laundry during acceptable hours if staying in a rented apartment or shared housing area! If you are packing liquid or gel items and flying, most countries, including the United States, United Kingdom, and European Union countries have restrictions on the size of liquid containers you can pack in your carry-on luggage. Be sure that any items in your carry-on are in 3.4 oz. (100ml) or smaller containers and packed in a transparent liter sized bag. If the container is more than 3.4 oz., you will need to pack it in your checked luggage or it will be confiscated by security. So that’s our guide to doing laundry while traveling! We hope you have found it helpful, and you might want to check out more of our travel tips. Have you had experience washing clothing while traveling? If so, please tell us about your travel laundry experiences and what you have found helpful. Any special items in your travel laundry kit? We’re always looking for recommendations! If you have a question about doing laundry while on the road, just leave us your question in the Comments section below! I like that you mention how laundromats can sometimes offer dry cleaning services. If you need these services, you could also find a local dry cleaner. When choosing one, it could help to find one that offers pick up and delivery services so you can schedule to have your clothing properly cleaned whenever you want during your trip. While I always opt for professional laundry when I travel, I do agree that knowing some laundry tips can come in handy. 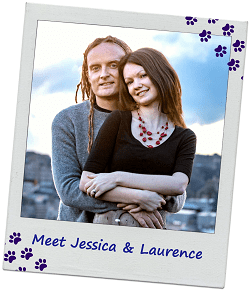 So thank you Jessica for sharing this amazing guide! really helpful!! I really appreciate your tip to avoid buying products that have any toxic chemicals in them. My wife and I recently got married, and we have never had to buy any of our laundry soap before. I will be sure to tell my wife that we should find a soap that isn’t toxic. I just saw you on House Hunters International. At the end, you were shown removing your washing from a clothesline. I laughed when you said it was old fashioned. With our clean environment and plentiful sunshine, line drying is normal practice here in Australia. It is superior for many reasons, but most importantly, it is better for the environment. There is an Australian invention called Ezyline (https://www.ezyline.com.au/) which I thought you should also be aware of. I have no affiliation with them, but use their product over my bath. Yes, that scene on House Hunters International was quite contrived and the “laundry” was just clean dry clothes I was hanging 🙂 I am from the USA and we often hung laundry out to dry growing up but here in Scotland often just dry it inside as the weather is often not ideal. Thanks for the rec about the clothesline, it looks like a great local product. But they don’t seem to be able to ship outside of Australia yet but perhaps they will in the future. I was concerned about doing laundry when traveling from Germany to new places, but this has helped me. Thank you for posting. Great practical tips on doing laundry on the road. We are relatively new and recently retired RVers in the USA, and were looking for some info on handwashing and doing laundry in the confines of a RV. We have a very tiny sink so loved the suggested about the large dishpan, washboard (never would have thought of this one! ), drying rack, and travel washline. All are going onto the list of things to buy now! Thanks so much for this very practical article. Great suggestions, we always try to have at least one accommodation with laundry facilities! Great suggestions, Jessica. I tried all these methods, except for a Scrubba washing bag. We usually rent apartments which are equipped with washers and dryers. However, I don’t like doing laundry when I travel. That’s why I prefer carrying a bigger bag. Such a thorough article and great tips! When I traveled for work, I used to do laundry at the hotel and some of them charged crazy amounts. Now for longer trips I would try to find an airbnb that had a washer. I agree small items are easy enough to wash by hand. 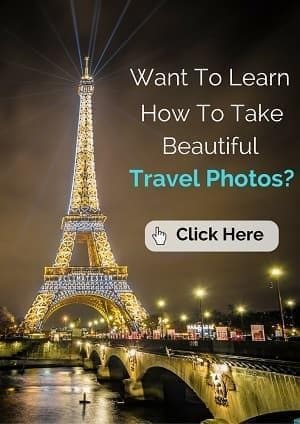 I was wondering when someone was going to tackle this subject in a travel blog post. Unless your holiday trip is short, like 7 days, where you can wait to clean your laundry once you are back home, it will become necessary to wash clothes on the road. These are all good tips. It seems washing bags are becoming more popular. I will have to try that in the future. What a fantastic guide to doing laundry on the road!! I usually take a two week summer vacation each year and pack about 7 days worth of clothes, so always need to do laundry while traveling at least once. Used many of your solutions – including coin laundry, campsites, hand washing etc – even own a Scrubba and travel clothesline. But you know I’ve never taken a sink stopper even though I have run into the same problem where there is no plug for the drain!, urgh! Thanks for this reminder as I need to get one for our next trip! The once cruise I went on we had complimentary laundry, which was AWESOME. I’ve done a lot of laundry in the sink over the years. I love the soap sheets because you don’t have to worry about flying with them. Having a sink stopper is a great idea because the sinks always drain… I don’t care where you are, keeping the water in the sink is always a challenge! !